This shady character has been sighted in multiple worlds trying to amass an army of Heartless. His bowling-ball attack causes negative status effects at random. Though aggressive in combat, he'll flee the moment his HP runs out. Maleficent's lackey, a time-and-again troublemaker who has snuck into the datascape for some nefarious purpose. Pete has gained new powers: the ability to teleport and strike from a distance. He can even use D-Thundaga. 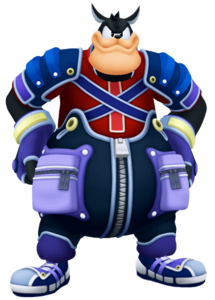 Pete is a boss in Kingdom Hearts II, Kingdom Hearts 358/2 Days, Kingdom Hearts coded and Kingdom Hearts 3D: Dream Drop Distance . Pete appears as a boss in Kingdom Hearts 358/2 Days. He is fought in Agrabah on Day 75, during Mission 24. Pete has a few attacks; first, he can punch Roxas and create shockwaves on the ground. When he punches Roxas, he gets hit a few times before Pete creates the shockwaves. Pete can also throw exploding balls. Lastly, Pete can run around with a glowing belly. "Fight alongside Hercules to defeat Pete before the cave collapses!" Sora is required to protect Megara from damage while Pete and a legion of Heartless try to attack her. The fight takes place in The Lock. 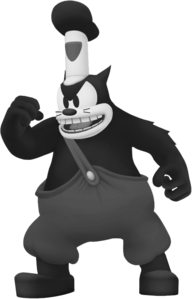 Pete can easily be defeated with melee attacks, but more emphasis should be placed on the Heartless because they are more agile and can get to Megara rather easily. After protecting Meg long enough, she leaves the fight and now Sora must face and defeat Pete in two minutes (90 seconds in Kingdom Hearts II Final Mix and Kingdom Hearts HD 2.5 ReMIX) before the cave collapses on them. Here, Pete summons Heartless to try and waste time. Though the Heartless can give additional experience points, focus mainly on Pete. Pete uses his barrier, which also acts as a double edge sword when Sora uses the Reaction Command "Pinball" to send Pete rolling directly at Hercules, who destroys his barrier with one punch, leaving Pete stunned for a while. Pete also has one attack that he never uses after this battle. He will summon a giant rock that will directly drop on Sora unless he uses the reaction command "Aura Guard" with Hercules to shield himself from it. The point of this battle is not to defeat Pete, but to get back the Cornerstone of Light. Pete's steamboat will be in the middle of the river and he will try to escape while hurling objects in Sora's way. Use the Reaction Commands to block and toss them back at Pete. Once Pete's HP has been depleted to a certain extent, he will lose control of the boat and it will move to the river bank—use the reaction command "Grab" on the hook and hit the cage containing the Cornerstone. Sora can then use the reaction command "Hang On" to keep hold of the hook and continue attacking the cage. Be on guard against the Minute Bomb Heartless attacking every now and then. Repeat and heal when necessary. "Eliminate Pete! The other Pete will help you in battle!" Pete is not at all a tenacious enemy. One move becomes very evident in this battle: the Temper Tantrum (indicated by the line "Get outta my way! "), which is a close-range attack—Pete pounds his fists on the ground, generating a short range but powerful shockwave and sending Sora flying. Sora is capable of damaging the present Pete, as well as past Pete: lock-on to the present Pete. If Sora has not racked up any Anti-Points from using Drive Forms (refer to AntiForm), then he can safely use Valor Form. Pete can be defeated with melee attacks, although that requires some effort and a lengthy battle. When past Pete starts to roll around like a ball, Sora can use a reaction command and roll him directly at Pete, dealing damage and stunning Pete enough to get attacked. After taking enough damage, he will change the arena (shown by when he crouches down and shouts "How bout a change?! "), based on the Windows of Time. Scene of the Fire: He will summon the burning building near the harbor, as well as the flames. Destroy the flames if needed. Mickey's House: The whole area will change into the house's room. Pete will conjure the black hole from before, dealing minor damage. Hitting it will not work this time. Liliput: The third area is the tiny town. However, the town is gone and there are three cannon towers. They will activate when Sora gets near them, dealing damage to Pete. Construction Site: The final area is a wooden platform, held by a rope, many feet high over the ground. Pete will pound the platform as soon as the transition ends, making everyone jump into the air. Only a few Reaction Commands while in the air will end the fight. Sora fights Pete alone and the encounter is much more difficult. Pete's full skillset is put to use here. Pete occasionally uses his Temper Tantrum attack. When Pete creates a shield (indicated by the line "Look kids, Pete's invincible!") he is temporarily invincible, and this time, quite a bit of his HP is also restored. Pete is capable of throwing explosive bowling balls at Sora, although these can be evaded or deflected using Guard. He can also use fireworks to immobilize Sora. Pete's attacks are very predictable: he starts off with the shield, and then throws the explosive balls towards Sora, finally Temper Tantrum comes in. The only attack which is less predictable is the one with fireworks. Guard against the bowling balls (or Dodge Roll out of harm's way). When he attempts to use Temper Tantrum, try getting behind him and attack him as much as possible. Physical attacks slow Pete down and make him lose his guard. Be sure to heal when necessary. Pete is fought in two phases during the ending of Hollow Bastion Part I. It would be wise to readjust Sora's Commands to his regular fighting style, as he regains the Keyblade and will not be aided by Donald or Goofy. Thunder-based attacks are Pete's weakness, but use the quick physical Commands and not the slow magic ones. Pete uses many of the same attacks as he did in Kingdom Hearts II in phase 1. 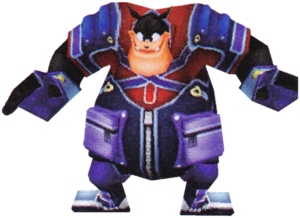 His bowling ball attacks can and should be deflected, as they can inflict Slow and Confuse on Sora. His fireworks now shower around Sora after a slight delay, blinding on impact. However, Pete does not use his invincibility barrier as often as before, choosing instead to teleport in a puff of smoke away from danger. He will only use the barrier when getting struck by Thunder-based attacks. After Pete does a combo, his finisher will end with multiple Danger Blox dropping and possibly a Prize Blox. When entering phase 2, Pete immediately uses his newest move, D-Thundaga, where he transforms himself into a ball of lightning and chases Sora around the arena, casting Thunder when in range. Dodge Roll or Air Slide whenever he gets too close. Otherwise this Pete is much the same, just slightly stronger. Pete is also fought during the events of the Hollow Bastion world card at Castle Oblivion. While the objective is to defeat him as fast as possible, it will not be easy, as he frequently teleports around the room and blocks Sora's path with Blox. Be sure Sora has abilities such as Cure Boost, HP Boost, Attack Haste, Magic Haste, Item Boost, Reload Boost, Combo Plus, and Leaf Bracer. These are more crucial when fighting Pete and his cronies in the Secret Portal. The key to beating Pete is by taking out the Beagle Boys first, one by one. Once one of the three is out of HP, use Reality Shift: Wonder Comic to launch him to Pete, who's on the stage's ship. Do the same for the other two. They can be defeated in any order. Begin attacking Pete as soon as the Beagle Boys have fallen. The best commands would be Balloonra/Balloonga, Thunder Dash, Sonic Blade, Sparkra/Sparkga among others. Be sure to have at least two Curagas and a Drop-Me-Not if necessary. Also, the Spirits in Sora's party should be those that can do any of the following: Decussation, Aura Raid, Prism Light, Union Rush, or Trinity Limit. At some point in the battle, Pete will hop on on the sun in the ceiling and fly across the stage. The best place to take shelter at that time is in one of the two sides of the stage; dodge rolling will be more difficult because the moon will also swing back and forth with Pete and the sun. Once he's off, finish attacking him and use Reality Shift: Wonder Comic on him to finish the battle. ↑ x0.60 during the first battle in Hollow Bastion. ↑ x1.0 when fought in the Secret Portal. This page was last edited on 14 March 2019, at 19:04.